It’s the Thursday evening before Memorial Day weekend. Maybe you’ve got plans, maybe you’re looking to start the weekend a little early. Or maybe you’d like to unwind after a busy day and do something a little off the beaten path. We have you covered. The first ABM Happy Hour is on Thursday, May 26, from 5:30 – 7pm. 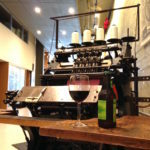 Come take a convivial tour of our amazing exhibit of working 19th century bindery equipment, enjoy an adult beverage, and wind down from the work day.The price is $15 and covers refreshments and admission. Fun and good company included.